Yes, welcome to our new office! 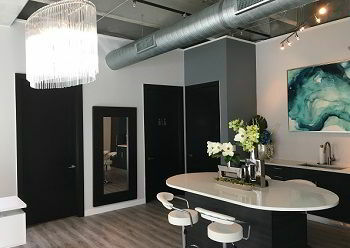 We’re here at 228 North 11th Street, Suite 9, in the Channelside area, close to top Tampa attractions like the Florida Aquarium and Tampa Bay History Center and many exciting developments from two groundbreaking multi-billion projects, Water Street Tampa and Port Tampa Bay. There’s the soon-to-open waterfront destination Sparkman Wharf, which will replace the Channelside Bay Plaza, and which will offer an outdoor dining garden with ten experimental dining concepts, a crafted-beer bar, a one-acre waterfront event space overlooking the Garrison Channel, lofts for incubator businesses and retail spaces. Come and visit us and let’s help you find your dream home in the Tampa Bay area. Or if you’re selling your property, we can help you sell it. If you want to have a quick estimate of your home, you can get a report for free here: Your home value. You can start viewing properties on our website. You can search by communities, cities, or counties. Or you can do Custom Search — enter your preferred price range, size, number of bedrooms, etc. You can also contact us by email (info@tampa4u.com) or by phone (813-671-6657) or write us a note here on our Contact Page. Get up close to mostly Florida’s aquatic and terrestrial animals and ecosystems. The aquarium is a premium place to view wildlife, with its large simulated ecosystems, guest-friendly layout, 4-D theater, outdoor splash park, playground, food court, gift shop, all well-maintained and clean. There’s a bar where parents can relax while the kids play. Florida Aquarium is in lists of Top Aquariums in the country, making it one of Tampa’s jewels. Enjoy three floors of interactive and entertaining exhibits and videos that can keep kids interested throughout. There’s the newly-launched Treasure Seekers gallery, where you encounter conquistadores, pirates and shipwrecks. Have lunch at The Columbia Cafe, buy souvenirs at the gift shop, or spend some time at the boardwalk. There’s also a playground and a biking area. Welcome to a one of only 4 fully-operational World War II ships in the country! It’s included in the National Register of Historic Places. Explore the entire ship freely, its cavernous cargo holds, galley, weaponry, radio and gyro rooms, hospital, steering stations, flying bridge, wheelhouse, crew cabins, mess halls, lifeboats, cargo equipment, the engine and exciting exhibits. The ship will transport you back to the time when brave sailors fought the harsh seas to bring ammunition, materials and goods to their comrades around the world. Enjoy big concerts, events, conferences and Tampa Bay Lightning games here! The arena is among North America’s top venues, hosting more than 150 events every year. It has party decks and bars, 69 suites, suite catering, three decks and seven separate levels, and in-arena dining concepts. Here’s where you can relax in the middle of busy downtown Tampa, a lovely park with nice views of the water, which is the Garrison Channel that connects to the Hillsborough River. It’s between the Tampa Bay History Center and the Marriott Waterside Hotel and right across the Amalie Arena. It has a playground, pier, jogging path, a canoe launch area and it’s dog friendly. Just walk to the popular Columbia Cafe for dining. See 2.4 miles of what’s Tampa is all about along the Hillsborough River! Our office is near the current southern terminus of the Riverwalk, which is the South Plaza. From this southern end, you see the Florida Aquarium and the currently being-developed Sparkman Wharf project. You walk on to see the Tampa Bay History Center, Cotanchobee Fort Brooke Park, Amalie Arena, Marriott Waterside Hotel, Sail Pavilion, Tampa Bay Convention Center, Gasparilla Pirate Ship, University of South Florida Park, MacDill Park, Kennedy Boulevard Plaza, Henry Plant Museum, University of Tampa, Curtis Hixon Waterfront Park, Glazer Children’s Museum, Tampa Museum of Art, David A. Straz Jr. Center for the Performing Arts, Water Works Park and Spring, Ulele, Tampa Armature Works, and the ongoing Heights Riverfront Project. There are lots to see — bridges, street underpasses, memorials, busts, buildings, restaurants, river docks. Evoke feelings of nostalgia by riding the streetcar. It’s a great way to see things along the way from downtown Tampa to Ybor City and back that otherwise you wouldn’t notice if you’re driving a car. From our Tampa4U office, we can just walk to the York Street station. Here’s the downtown Tampa Streetcar map and the Ybor City Streetcar map. ««Are People Moving to Tampa Because of Jobs or Location?